With my recipe perfected at last, it started making sense to freeze our excess milk in preparation for a big batch of chevre. Two weeks and twenty-three cups later, I thawed the milk out in the fridge (and on the counter for the last couple of hours) and then whipped up the big cheese. What's up next? Dr. Fankhauser's cheese tutorial suggests a basic pressed cheese or American mozarella, while my milking trainer instead recommends trying feta with the lipase she's giving when we pick up our annual lambs. 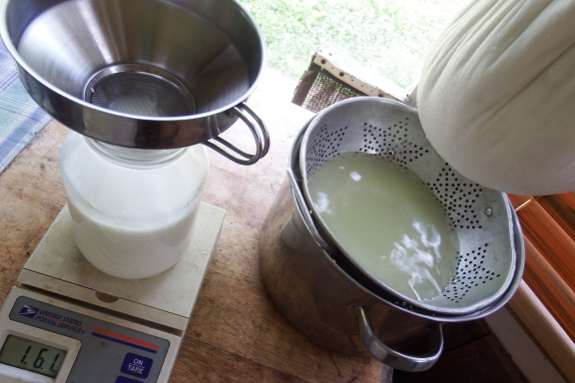 Since we haven't yet rigged a cheese press, we'll probably try the feta or mozarella next, but I'm open to suggestions. What do you recommend as an easy beginner cheese? No suggestions, both are good, but I would nix the aluminum colander if you want to use the whey for further cheese making. Our investments in stainless cost us almost as much as our cow! To quote Homer Simpson: "Cheese... MMMmmmmmmm." I vote for mozarella, but then I'm a mozarella fanatic. Nita --- Thanks for noticing that! I had forgotten that aluminum was bad even in the straining stage. Luckily, I think I have a stainless-steel steamer that would work for next time. 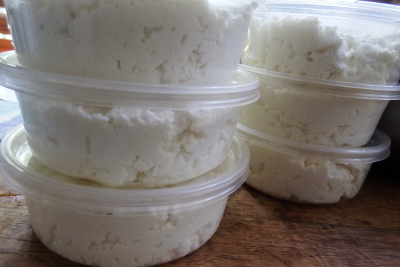 you can make paneer! I make mine by leaving the curds in the colander, salting them and mixing in herbs, then weighing them down with a sheet pan topped with anything heavy (multiple 28oz cans of tomatoes work well). Leave for about a half hour or so. The curds compress into a nice "cake" of cheese that can be sliced, dipped in a chickpea flour batter and fried. It's one of my favorite things to eat, especially with a nice chutney. Never tried it with goat cheese but I imagine it would be delicious. I opt for Feta. I often make a wonderful salad of 1 part blueberries, 1 part small cucumbers, cut lengthwise in quarters, then sliced in 1/4" pieces, 1/2 part feta cheese. toss together, and add a mild salad dressing. I use a Raspberry dressing. MMM, GOOD! Thanks to everyone for more great suggestions! Sheila's salad sounds especially good and will be in season here in about two or three weeks. Looking forward to trying it!